Our barbecue grills get a lot of use cooking up delicious burgers, brats, and hotdogs. We can also enjoy an occasional steak, shish-kebab, and fish. Another true summer grilling pleasure, however, is grilled fruit and it’s one we often forget to add to our menu. 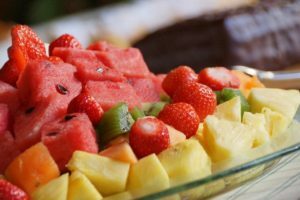 Some of the more popular choices are grilled peaches, pineapple, and watermelon though even strawberries, apples, and coconut can be delicious as well. The heat of the grill brings the sugars to a sweet caramelized flavor and makes the fruit seem to burst with flavor. It’s easy to do and the fruit will disappear as fast as you pull it off the grill. You can cook on tinfoil if you’d like while some cook on a pan that has been perforated to allow the smoky flavor to permeate the fruit flesh. You can spray the surface lightly with oil to keep the fruit from sticking to the grill grates. It won’t take long as you only leave the fruit for a few minutes on each side. When you flip it the first time you’ll smile to yourself when you see those beautiful grill marks that have decorated that lovely fresh fruit. You might like to have some ice cream on hand and add a scoop as a cool and creamy balance to your dish. You might also like to try and save some for breakfast though that’s not easy. Your campers are going to try to polish it off on you. We hope all your camping meals are tasty and enjoyable. Grab some of those delicious summer fruits and drop them on the grill. We are sure you’ll be glad you did.